The most awaited news of the year is officially here! USB Promoter Group has officially announced USB4 specification, which is an extensive upgrade over USB 3.2 specification. The new specification guarantees double the speed of USB 3.2 Gen 2×2, and has built in Thunderbolt™ 3 compatibility. The official specification release is expected by mid-2019. The new specification will use the existing USB Type-C connector/cable assembly, accentuating USB IF’s push towards a rapidly evolving USB Type-C ecosystem. USB4 will use USB Type-C’s dual Differential Pin assembly to generate dual lane data at the new data rates, however it will be possible with the compliant cables only. “The primary goal of USB is to deliver the best user experience combining data, display and power delivery over a user-friendly and robust cable and connector solution,” said Brad Saunders, USB Promoter Group Chairman, in a press statement. The above statement and adoption of Thunderbolt clearly hints that USB4 comes with the capability of running numerous Display devices along with conventional USB traffic, where USB Controller can manage and share the available bandwidth using optimization algorithms. Thunderbolt™ – Intel’s Thunderbolt™ specification recently became open-source, making the integration of Thunderbolt and USB4 easier. The main motive behind this integration is to enable USB4 to leverage the popular Thunderbolt eco-system. New devices with Thunderbolt over USB4 are expected to become cheaper, and the USB interface would be adaptable to more display devices and GPU boxes, courtesy to the royalty-free Thunderbolt. Bandwidth Optimization –The press release also announced the introduction of a mechanism to share bandwidth and traffic prioritization. More details are anticipated, but the expectation is that USB4 would have a daisy-chain mechanism where a certain bandwidth would be distributed and managed among multi-protocol peripherals. This would certainly be applicable to display related peripherals, but which other devices will be supported is yet to be seen. There would be considerable upgrades in USB Type-C and USB Power Delivery specifications also, considering the expected changes in Power Ratings, Capabilities, and other Vendor specific parameters. Final branding, marketing logos and other technical details are expected in the coming months. Synopsys is the market leader for IP and VIP for USB. We are the only provider of a complete verification solution for USB including the industry’s first subsystem verification solution, VIP, and source code Test Suite for USB4. 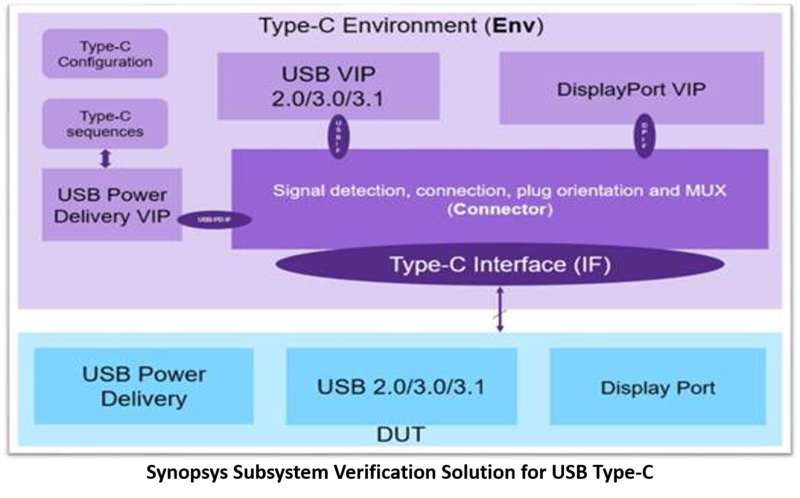 Synopsys was the first in industry to deliver VIP and source code Test Suite for USB 3.2 and USB Power Delivery 3.0. In addition, Synopsys worked with early adopters of USB Type-C – read about ASIX’s Adoption of Synopsys USB Type-C Subsystem Verification Solution​. The complete USB verification solution from Synopsys also includes VIP and source code Test Suite for USB 3.1/3.0/2.0 and Power Delivery 2.0. We are working closely with the early adopters of USB4, and contributing significantly to the evolution of the USB ecosystem. For more information, please visit http://synopsys.com/vip. This post is filed under Automotive, Mobile SoC, Type C, USB.